During nine months of captivity, Kate Winters has survived a jealous goddess, a vengeful Titan and a pregnancy she never asked for. Now the Queen of the Gods wants her unborn child, and Kate can’t stop her–until Cronus offers a deal.In exchange for her loyalty and devotion, the King of the Titans will spare humanity and let Kate keep her child. Yet even if Kate agrees, he’ll destroy Henry, her mother and the rest of the council. And if she refuses, Cronus will tear the world apart until every last god and mortal is dead.With the fate of everyone she loves resting on her shoulders, Kate must do the impossible: find a way to defeat the most powerful being in existence, even if it costs her everything. What's Divine About The Goddess Test series? I'm honored to be a part of the Blog Tour for The Goddess Inheritance, the final book in The Goddess Test series. What makes The Goddess Test series so divine? It's the perfect combination of great characters, a fascinating mythological background. I've never been a big fan of Greek mythology, but the Goddess Test series makes these ancient myths come alive. It's the perfect series for people like me who learned the myths in school, but doesn't entirely remember them. Kate and Henry are the heroine and hero of this series. Kate is the human who goes to live with the gods. She is a study in contradicting. Extremely giving and self-sacrificing, but also impulsive, temperamental, and hard-headed. Henry is hard to love at first. He guards his heart so carefully that he seems like an emotionless shell. But really he is kind, sensitive, honorable, thoughtful, and haunted by lost love. Not only are the main characters of this series fully fleshed out, but you have a whole host of strong side characters. I can't really say too much about them without giving away the main surprise of the first book, The Goddess Test, but I promise that they are all flawed characters with independent lives that we learn more about as the series goes on. If you really want to get a feel for the characters and the mythology, I'd actually suggest starting with The Goddess Legacy, a collection of novellas, which tells the story of the gods and goddesses who form the backbone of the series. We learn how Henry became Hades and see the origin of his pain. We see how the "adults" in this series are really the devious, flawed gods and goddesses of traditional Greek mythology that everyone loves to hate. The Goddess Legacy (it's technically Book 2.5) gives away some of the major surprises of The Goddess Test, but it made the whole series so much richer. I loved how Ms. Carter enriched the somewhat boring myths that I read in school and made them come to life! Enter for the chance to win a copy of any one book in The Goddess Test series. 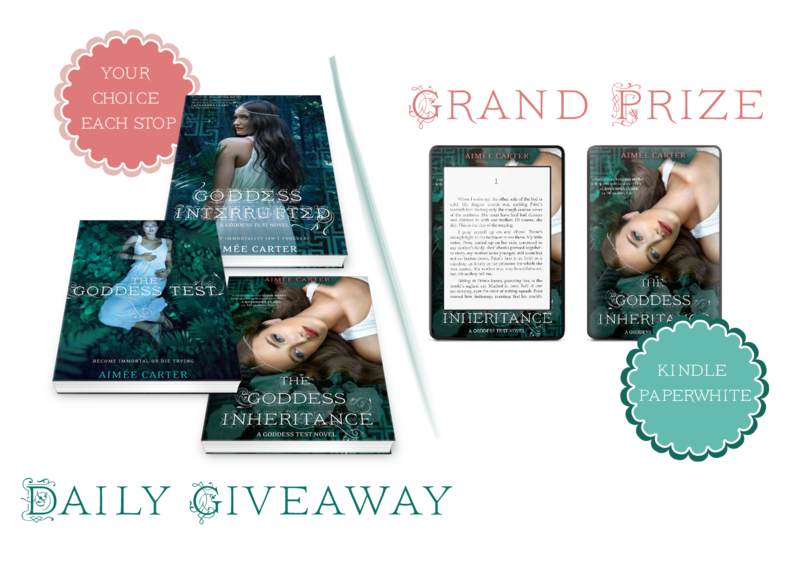 Even better, all entries into the daily give-away count towards the grand prize give-away of a Kindle Paperwhite skinned in the gorgeous and lush The Goddess Inheritance cover art! Check out all the stops in the The Goddess Inheritance Tour! I do love the cover though! Loooved this series. I think what I liked most or was most divined was the characters! They were just awesome and so fully developed that they always took you by surprise in their actions! I haven't read these books yet, so I don't know! While I don't know the true "divine-ness" about the series, I'm very curious about the depiction of the Greek Gods and how the "parents" are the deceiving ones. I think it's the characters! They're background and the fact that they are Gods!!! How have I not heard of this series!? I love Greek Mythology! I love the characters in The Goddess Test. And I absolutely love the Greek Mythology aspect to the series. I was always so fascinated by Mythology in high school. I am very interested in this series. I love this series! Can't wait to read The Goddess Inheritance! The mythology would be the most divine thing. I love mythology! I haven't yet started this series, but I just requested the first book from the library. Awesome giveaway! Thanks for much for the giveaway! I recently read the last book and so sad to see the series end. Everything is so great!! But Henry is sooo divine :P Thanks for the giveaway!! I love Aimee Carter, love all of her books, all of them. This is one of my favorite series. I LOVE this series <3 <3 <3!!!!!!!!!!!!!!!!!!!!!!!!! can't wait to read the goddess inheritance!!!!!!!!!!!! I am not sure, I have not read any of the yet but I do love mythology. As for the most divine part, I think it would have to be the complexity of the characters. When you read the first two books, you hate some of the the characters like Calliope and Persephone, but when you read Goddess Legacy, you learn that there is a reason behind their actions and in the end they are just victims too. There are so many things that I like about this series. I like that Kate and Henry really work through their struggles and insecurities. I also love how it's based off of Greek mythology. I love this serious so much!! I think the best part would be seeing the Greek gods in a different light. I would love to learn how this series begin. So my choice is to win a copy of the Goddess Test. I do have the second book The Goddess Interrupted. I do have a habit of finding the series in the middle instead of starting with the first book. The divine is Henry telling Kate that he loves her. The most divine part of the series... the romance. I think the most Divine part of The Goddess series is how the books are writen. Amiees writing has a way of pulling you in, and making you crave more. I think the characters are the most divine part! I can't wait! Counting down the days until Goddess Inheritance comes out! I love this series! I think Aimee Carter is brilliant. I LOVE HENRY!! :) I can't wait until The Goddess Inheritance comes out!! YAY!! I haven't started reading them yet but love the beautiful covers! Thanks for the chance to win! I haven't read any of this series yet, so I don't know! I think they sound really interesting. Thanks for the giveaway! The characters! Ohhh the Characters are wonderful! The way the characters play their part. I think Henry and Kate's relationship is the most divine. There are ups and downs but you can tell that they love each other so much and don't want anyone else. I love this series! Can't wait to read The Goddess Inheritance. I am dying to know what is going to happen with Henry and Kate. Thank you for this tour and a chance at the giveaway! I think the best part is the development in Henry and Kate's relationship. I like the mythology aspect of the novels. I love all of the Greek Gods! I love Aimee carter and you guys for doing this amazing contest. something that is clearly divine is that it is everything i want all put together in one awesome book like romance mythology suspense. I love the characters! Their interactions are fun to read! I didn't want this book to end.....so good. hope another goddess test book comes out. kate and Henry are the best. The post is written in very a good manner and it entails much useful information for me. I am happy to find your distinguished way of writing the post. It has been part of their tradition to fight no matter if it will take their lives.